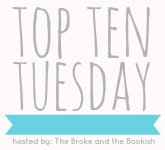 This week's Top Ten Tuesday prompt wants to know which authors will we automatically purchase their next book to read, no matter what it's even about. I have several favorite authors who have won me over with just one book (some even their debut!). There's just something about their story-telling that automatically makes me want to get my hands on their next novel. >>> more authors I will buy whatever they write... Sarah Dessen, Cassandra Clare, Jandy Nelson, John Green, Kirsten Hubbard, Veronica Roth, Melina Marchetta, Kirsty Eagar, Stephanie Perkins, Morgan Matson... and the list could go on! Gayle Forman and Jenny Han are absolutely on my list- love them! Great list! They write some of the best YA contemporaries, don't they? I definitely should have included several of these - it was SO HARD to keep my list to ten! That is why you see several added at the bottom of list, haha. We have some overlap! Jenny Han is definitely on my top. (Team Conrad). I'm so in love with your list, I kind of want to change/add some from yours to mine. Great list!! Jennifer Echols was on my list too. I will pretty much read anything Jennifer Echols writes. Even her grocery list, ha. There are so many amazing authors out there! It makes me sad that it's almost impossible to read all those awesome books. Well, looking at the bright side: there are still a lot of wonderful books to read! Love your list! Agreed. There is never enough time to read all the books! Oh Farrah, I'm so glad you read My Life Next Door.. love love LOVE that book! I hope you get a chance to check out Tara Kelly. I think she's someone you would definitely enjoy reading. I totally agree with Rainbow! Also yes, Huntley! I am SO EXCITED for her next book. Why is 2014 so far away?!?! I'm gonna have to check out some of these authors! <3 some Gayle Forman though! I definitely need another Huntley Fitzpatrick book in my life ASAP! I can't even tell you how close Jennifer Echols was to being on my list! SO VERY CLOSE, GINGER! Also, when am I going to get around to reading Jenny Han? Sigh. It makes me so happy that Huntley Fitzpatrick, Jessi Kirby and Trish Doller are on her - because I loved them LOADS too! I have no idea who Tara Kelly and John Corey Whaley are. But to be honest, I've only read Echols on your list and now I feel less of a book person. Too many awesome books to read!